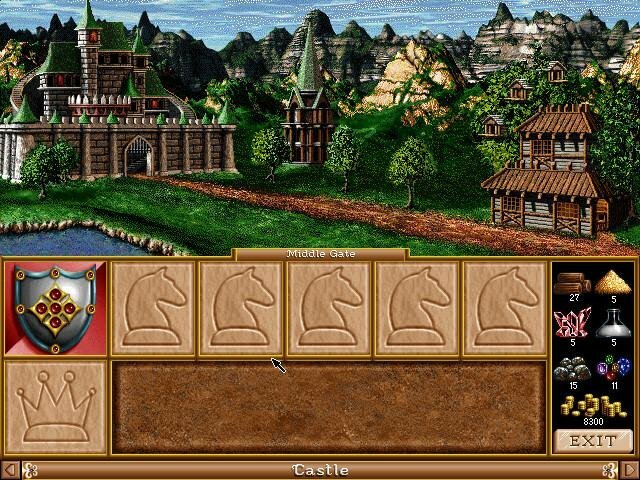 Is HOMM2 a sequel or a remake? 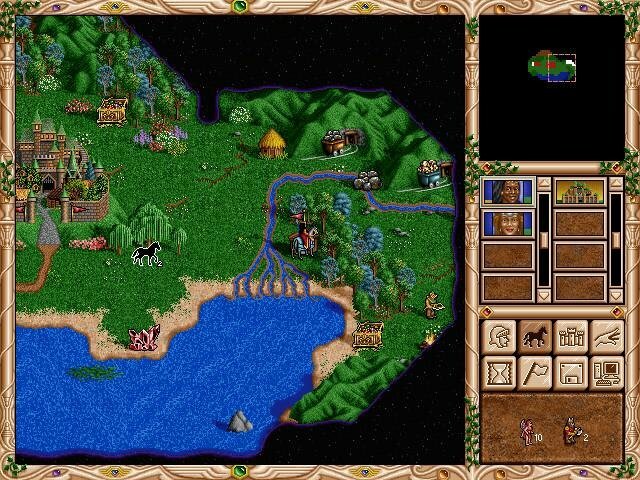 You think ‘sequel’ with games like Civilization II and SimCity 2000, elegantly improving on the formula they’re based upon, yet are still substantially different to warrant the label. Heroes II isn’t all that different from the first game, and comes off as more of a remake than anything else. This is not to say it’s bad, just that it’s ultimately not very different. The fundamentals are identical to the first game, particularly the “killer stack” mentality, whereby you bide your time building up a stack of powerful units and a hero bloated with ever more powerful artifacts. The ensuing rampage through the enemy’s territory into his cities tends to be anticlimactic. 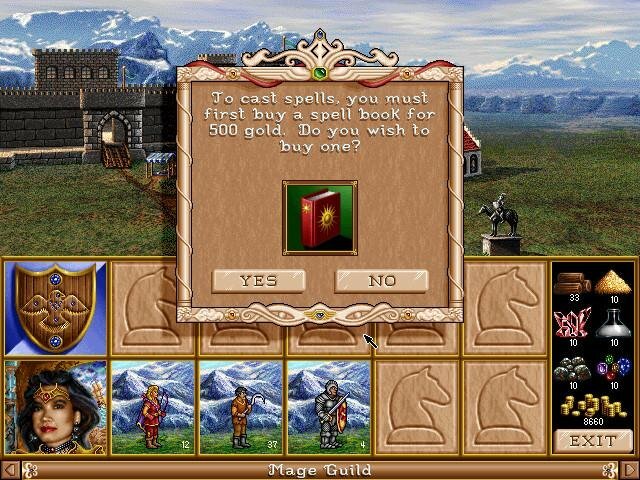 A token nod is made towards resources; you occupy mines and gather stray treasure, but the game always comes down to dueling stacks of huge armies in the end, even with the addition of variable victory conditions. 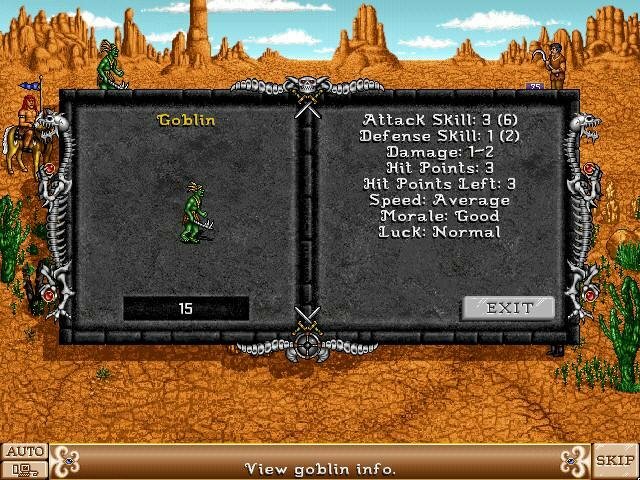 The nature of tactical combat has changed very little, with the exception of more spells and more room to maneuver. These two changes do, however, allow for more nuances in gameplay than the original. The new spread of spells will be useful for all sorts of different styles, allowing shrewd players more opportunities to modify attack and defense values while less advanced players will just lob fireballs. 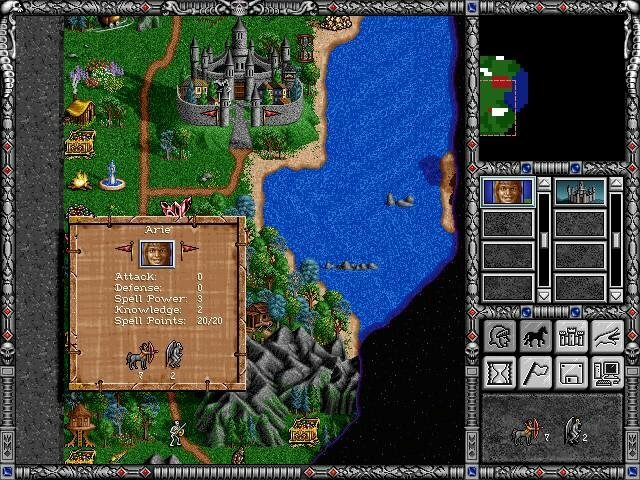 The map is considerably larger, so ranged attacks have more time to inflict damage and slow powerful units become a serious hindrance for offensive actions. Occasional obstacles in the battlefield can slow some units, but unfortunately, terrain still plays no role in combat. 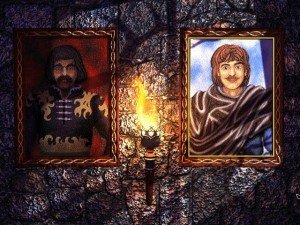 It’s fortunate that you can skip one-sided battles against petty foes, but you can’t do the same for when you yourself are overwhelmed – you have to sit through the entire crushing experience before loading a saved game. 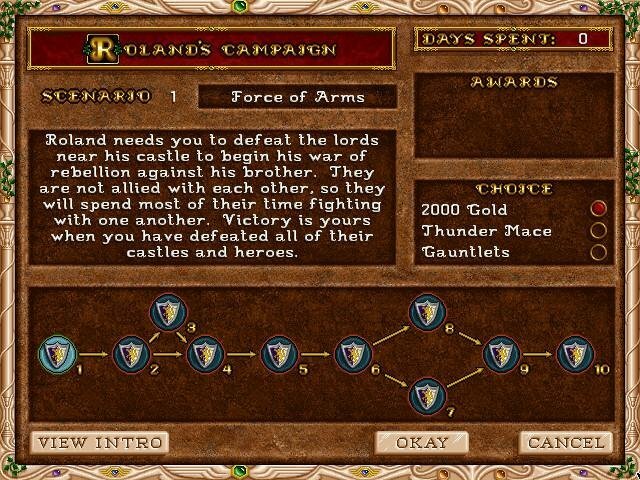 On the strategic level, there are more points of interest to find, but the onscreen information is spotty. For instance, if you’ve learned a spell from a shrine, you can’t click on the shrine to remind yourself what spell was taught there. 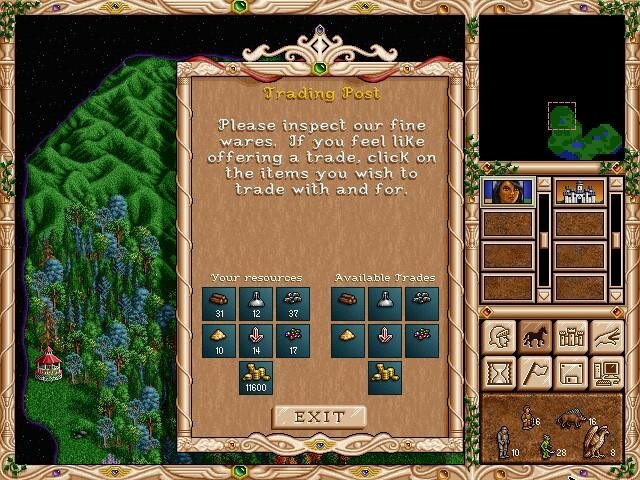 The artifacts strewn around the land are each indicated by unique icons, but there’s no indication of what icon is what artifact, much less what powers they provide. And since many of the new artifacts are specialized to the point of being useless, it can be expensive to fight past a horde of vampire lords, only to win the Sextant of Faster Boats in a land-locked game. This could all have been alleviated with more consistent right-click options and better references in an otherwise thorough manual. 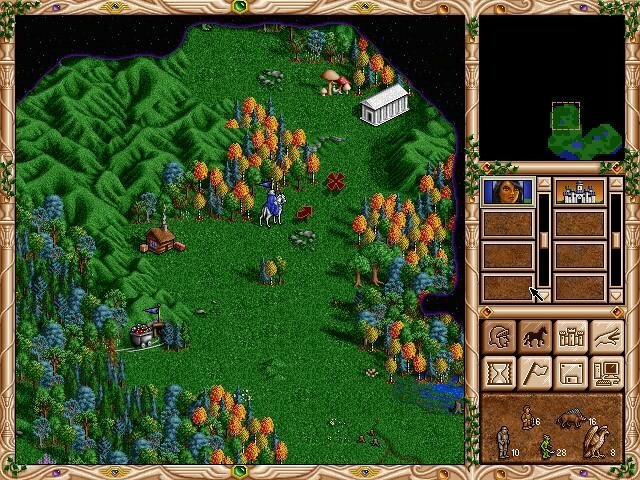 The graphics are crisp, clear and cartoony, with lots of detail and fluid animations in combat – essentially a hand-drawn Heroes in higher resolution. 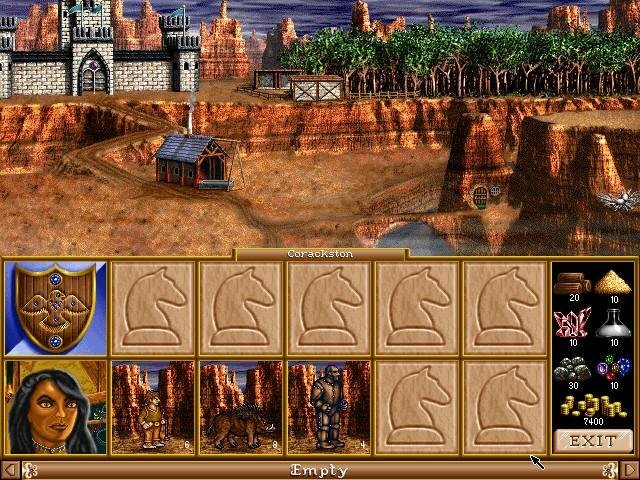 Each character class has distinctive city graphics and music. The city screens are breathtaking, as tiny hamlets grow into fully developed metropolises, but some functionality is lost in all this splendor. One of the most significant changes is the inclusion of a resource marketplace to trade for and buy scarce resources. 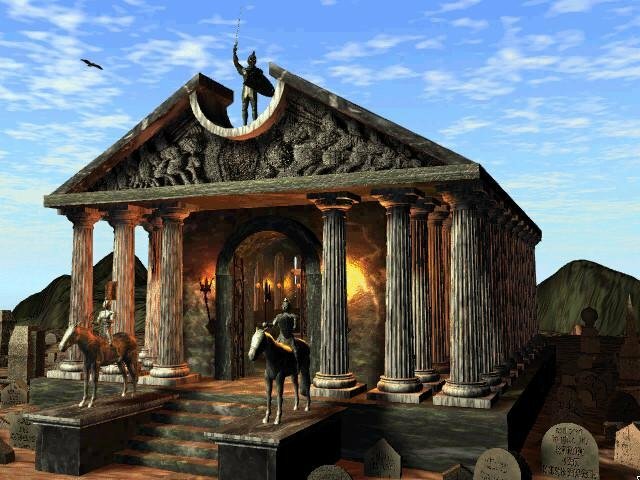 There are a few extra building types, but as with the rest of the game, there are no fundamental changes. 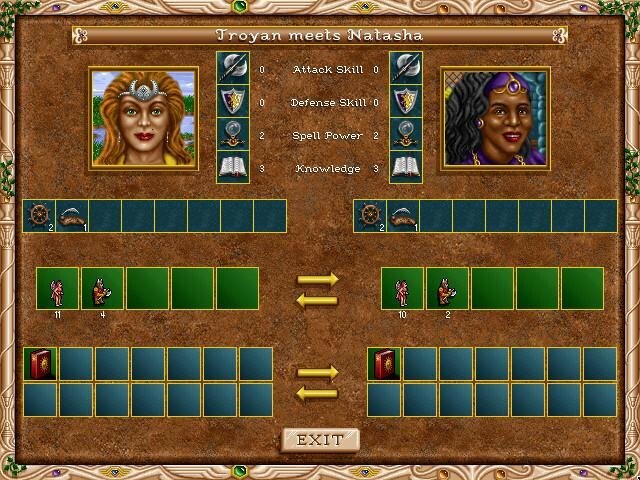 A new skill system makes heroes even more powerful, and gives them distinct personae as a game progresses. Unfortunately, this strength of the game is all but lost in a weak campaign scheme that’s merely a string of canned scenarios. The option to keep a hero through a series of games would have given this game a much longer-term appeal. Solid multiplayer gameplay and a comprehensive scenario editor make up for this somewhat. 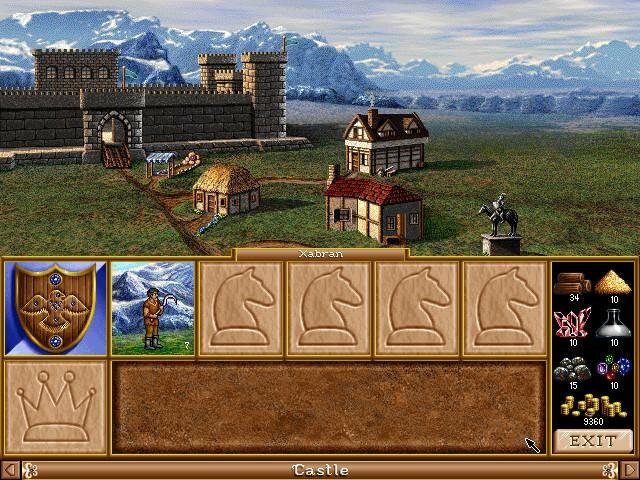 The multiplayer games are taxing, however, since the game locks a player out when he’s not taking his turn and there’s no way to limit turn length or cut out the tactical combat. 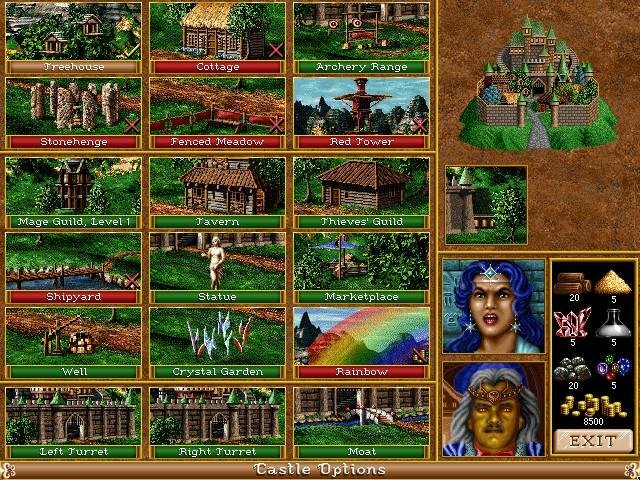 Heroes of Might and Magic was a simple yet intricate strategy game. 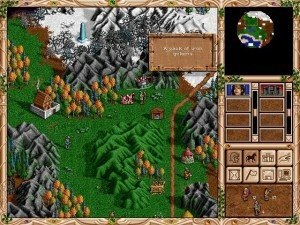 So if complexity isn’t high up on your list of priorities and you don’t mind a little deja vu, then this turn-based strategy relic from a bygone era should suit your questing needs. Thanks for putting here one of the best games ever in full format with audio tracks. 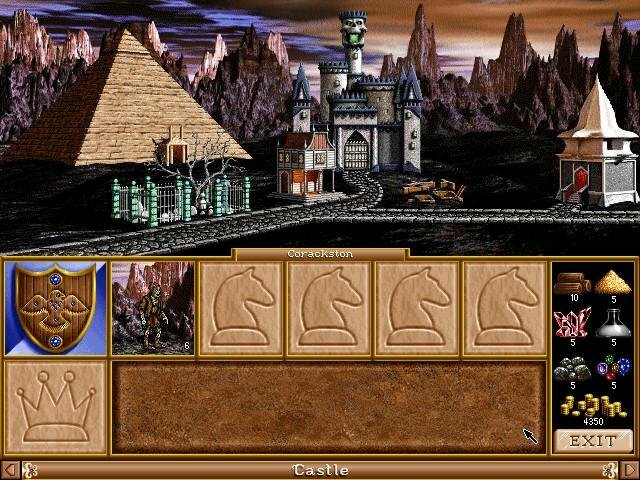 I played it back in my youth years and now when I found this website I was just curious how it plays again… any it’s so addictive. I meant to just check it for 5 or 10 minutes and have been playing now over 6 hours into the campaign. Thank you! Do you also happen to have an add-on Price of Loyalty? Awesome. 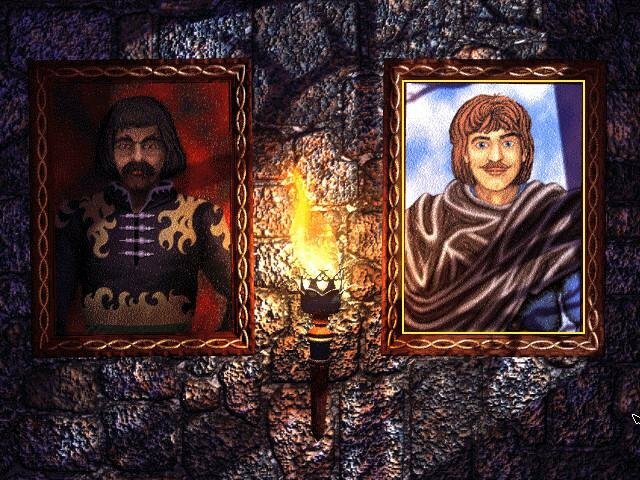 I like it too, but my favorite is HOMM3. 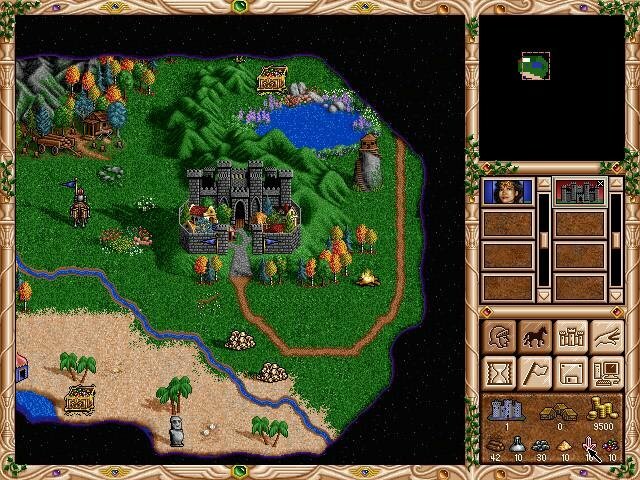 Will also post HOMM4, as I’m currently covering strategy and sim games. 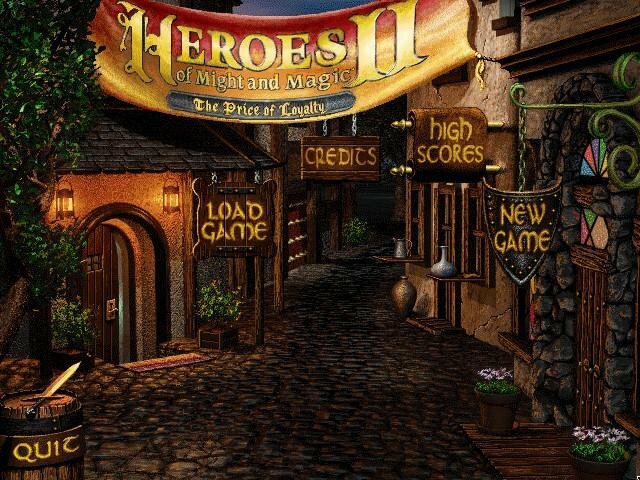 I have extracted Heroes 2 Gold and Mounted the HEroes 2 Bin File. Installed the game and get the Error that I must have the expansion CD in the drive. I don’t see any other mountable files. Also, there are Readme.txt but no NFO. The readme’s are from NWC release with basic game info.